06/83 : Swapped 6502B cpu for 65C02 cpu. 08/15/98 : Acquired Atari Logo, Atari Football, K-razy Antiks and River Rescue carts for $4.00. 11/02/98 : Calaxian cart for $1.99. 11/21/98 : Atari SX212 Modem for $2.92. 12/05/98 : Ms. Pacman, Pac-man carts for $1.99. 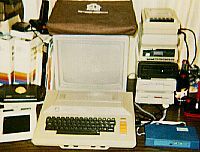 02/28/00 : Added 2 Atari 800s, 2 810 drives, Monitor, printer and misc software for cost of shipping. 02/00 : Received 2 800s, 2 810 disk drives, 850 interface, Epson MX-80IIIF/T printer, Zenith ZVM-131 color monitor, cables, power supplies, joystikes and piles of software and docs and books to numerous to list all for the cost of shipping. 08/05/01 : Was given Star Raiders, Missile Command, Pole Position and Frogger carts. This was my second computer. For a while in 1982 and 1983 I wrote and sold games for it through a company called Fanfair. Made a few bucks but I'm sure nobody has seen any of them (might be a good thing too). I currently have two 800s in my collection, one has a flaky keyboard though, and 2 850 interfaces. I have an interesting problem with my RANA 1000 drive, I can use it as a non-boot drive but if I try to boot from it I get "Boot Error" messages. One of my XF551 drives has a similar problem, it too works as a non-boot drive just fine, but if I try to use it to boot the system doesn't even recognize it at all, it boots into the memo pad mode. If you know where I can get these fixed or what may be the problem please let me know. Be sure and check out my Atari Library. I need a PSU for the SX212 modem and doc for it as well. Let me know if you can help out.